Supports adding quiz knowledge test anywhere on your posts and pages. Questions can have multimedia content and multiple answers. The admin can define the minimum score for passing quiz and based on that display or not additional content to the users. Includes a Progress Report system that can be filtered by quiz or users, allowing for smooth monitoring of your students. 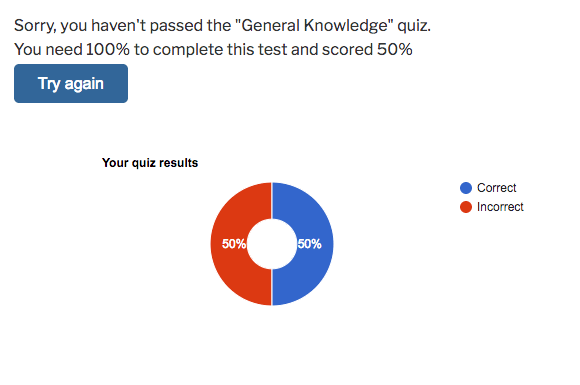 The Quiz Manager Plugin for WordPress supports adding a knowledge quiz to test users. The admin can define scores for passing the test and showing additional content. Each quiz can have as many questions as required, and each question can have multiple answers. The admin can mark more than one answer as correct. Questions support rich formatting and multimedia content. The admin can use images and videos to create an engaging quiz experience. Quizzes can have either a fixed list of questions or random items, providing many possibilities to test your users. Once the student completes the quiz, he/she receives a score in the form of a intuitive graph. The score is saved in his/her profile and shown in the admin quiz reports. 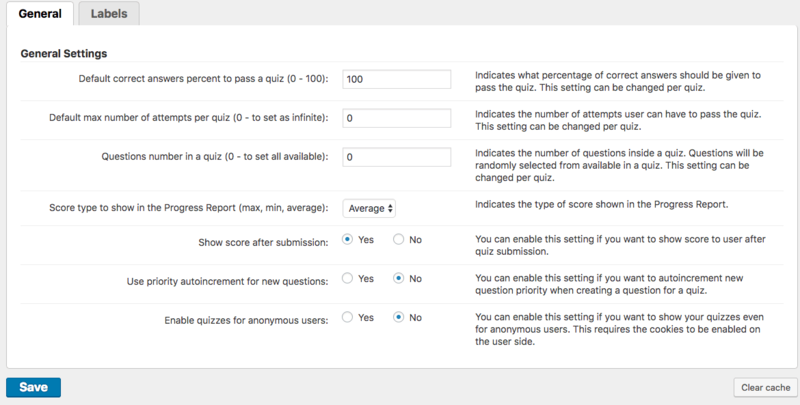 The admin can quickly view scores average, maximum or minimum for each quiz and user. Too many scores to analyze? It's ok: smart filters are available to speed up the process. Active Lessons – The quizzes allow you to grade your users and check their pace, enriching the learning experience. Go Beyond Text – Questions support HTML and multimedia content, such as images and embedded videos. Engage students by providing more than text. Shortcode Support – Display quizzes on any page or post by using simple shortcodes. Flexible Quiz – Each quiz can have any number of questions. Additionally, each question can have more than one right answer. This flexibility allows for simple “True or False” tests and also deep multiple answer questionnaires. Dynamic Quiz – Quizzes can have a fixed list of questions or present random questions each time. The admin can define this through a prioritization system, choosing which questions are more important. Lock Content Based on Score – Show content only to users who have a score higher or lower than you select. For instance, only users who scored over 80% in the test “Math 101” will be able to see a link that directs to the next quiz. 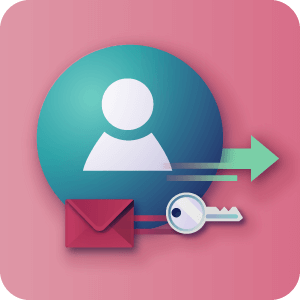 Progress Report – Monitor the progress of your users, including their minimum, maximum or average score. Group the statistics by user or by quiz and apply filters to easily navigate the data. 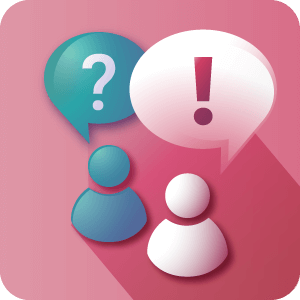 Show Answers – Once user submit his answers admin can check an option to show answers for all questions. What is a quiz? Why is it useful? A quiz is a collection of questions about a certain subject. It scores the user based on the given answers. This dynamic aspect makes it an especially engaging resource for users. 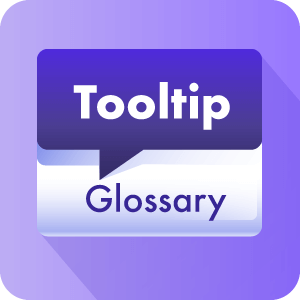 It’s useful for many purposes, such as a learning tool (e.g. Math Quiz, Student Exam) and entertainment (e.g. “How Much Do You Really Know About Beyoncée?”). Smart systems like the Quiz Manager WordPress plugin allow for questions with multimedia content, Progress Report, and more. Can I include images and videos inside questions? Yes. Questions support images, videos, text formatted with HTML tags and much more. The question editor works just like the base page or post editor on WordPress. Can I track the scores of my users? Yes. 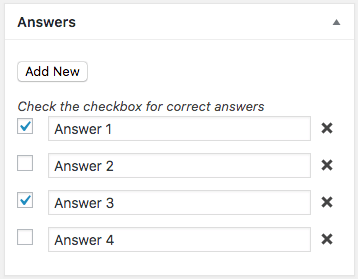 The Quiz Manager WordPress plugin features a Progress Report panel, where you can monitor scores and group them by users or quizzes. It also contains filters for easier navigation. For more information, check the guide How To – Check The Progress Report of Your Users. Can I include quizzes on any post or page? Can I change/translate the text displayed to the users? Yes. 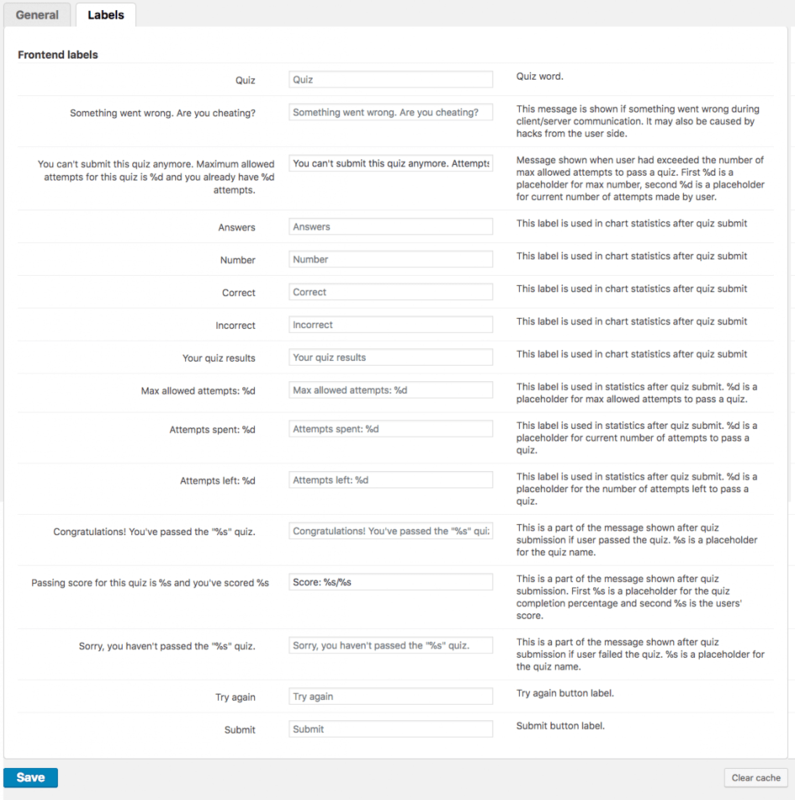 The plugin has a labels option, where your can change every text that appears to your users. For more information, check How To – Modify the Text that Appears in the Front-End (Labels). Can anonymous users have access to the quizzes? You can choose if guests can see and interact with the quizzes or not. If they can answer the quizzes, their scores will not be registered, preventing abuse of the system. For more information, check the guide How To – Enable Anonymous Users to Answer Quizzes. I want to show a certain content only to users who passed the test. Can I do that? Yes. 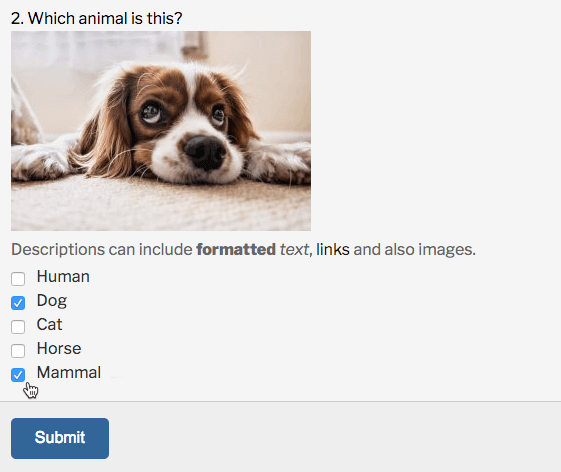 The Quiz Manager WordPress plugin allows you to display certain content only for users who scored higher or lower than a chosen percentage.